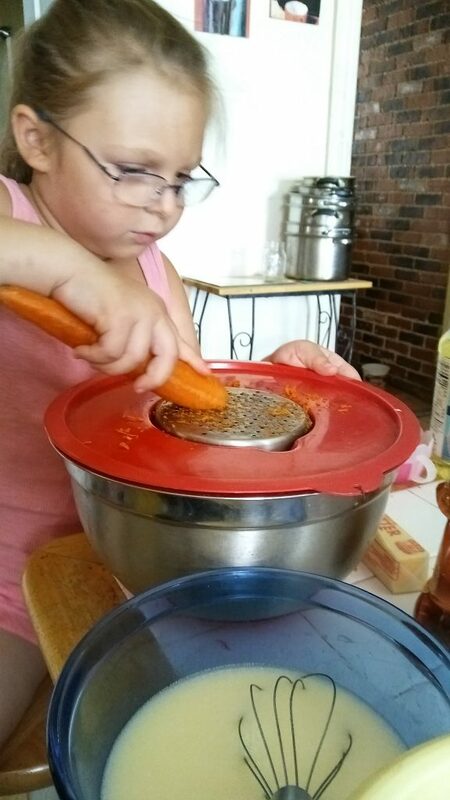 Note: One of the best things about this recipe is how many places there are for even the littlest helpers to get involved. 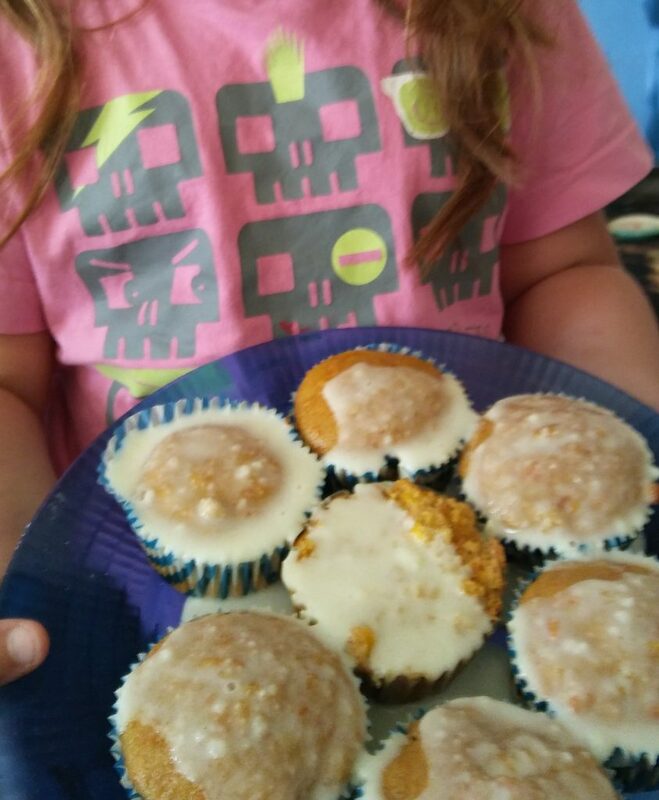 Here are just a few that 5-year-old Liv did for this recipe: strip the corn husks, grate the carrots, line the cupcake tins, crack the eggs, stir the batter, fill the tins, help take muffins out of the pans. Shuck the corn and cook it. Grate the carrots. 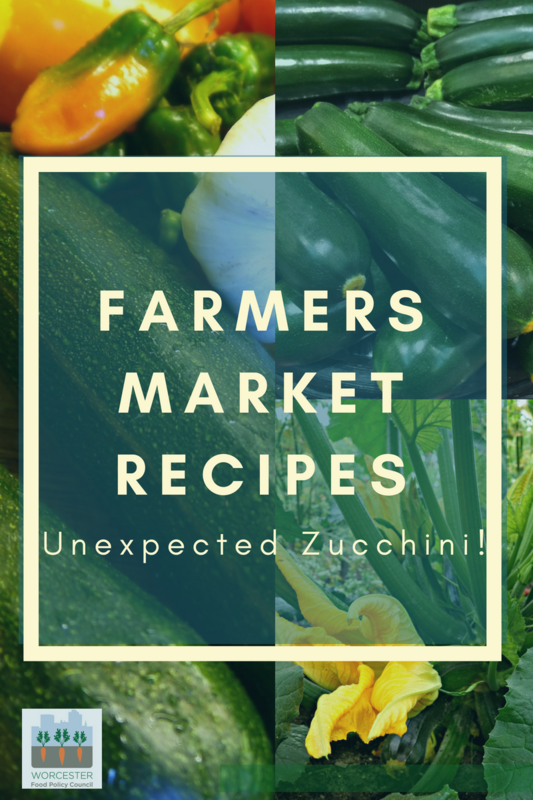 You can use a food processor for this, but grating them by hand is a good workout and leads to lots of wonderful conversation with your helpers. Grease the muffin tins or line them with cupcake liners. Slice the kernels off the corn cob. Add them to the grated carrot and set aside. Sift together the flour, baking powder and cinnamon. Stir the corn meal into the sifted flour. In a large bowl, beat the eggs, milk, vegetable oil and vanilla until well-blended. Stir the sugars into the egg mixture until the sugar is dissolved. Add the flour mixture to batter one cup at a time, beating well after each addition until there is no visible flour. Stir in the grated carrots and corn. Bake in the center of the oven until the tops are golden and spring back when lightly pressed – about 12-15 minutes for full size muffins, 6-9 minutes for mini muffins. Transfer the muffins immediately to wire racks to cool. This recipe makes 2 dozen regular cupcakes or 4 dozen mini cupcakes. They’re delicious on their own, but they’re also perfect for icing, jam, butter or frosting. We experimented with a ricotta cannoli filling, and it was a bit of a spectacular fail – well, kinda. They won’t win any beauty contests, but they sure do taste good! 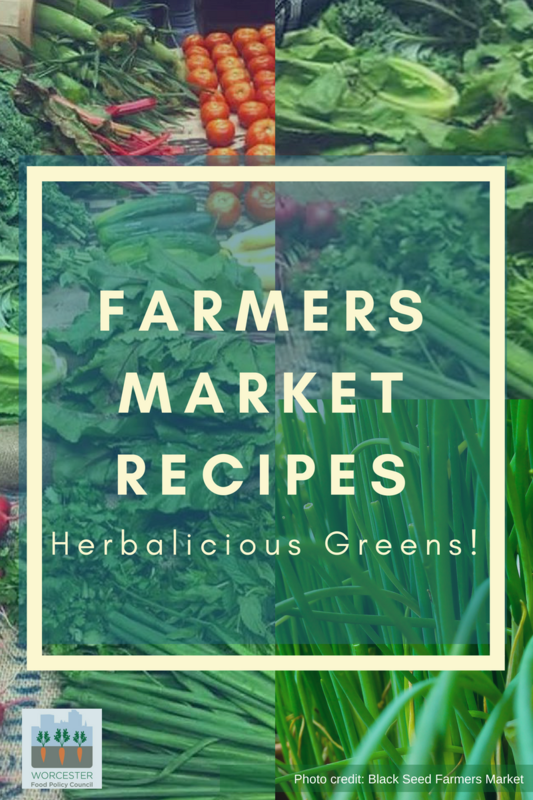 Farmers Market Recipes - Herbalicious!